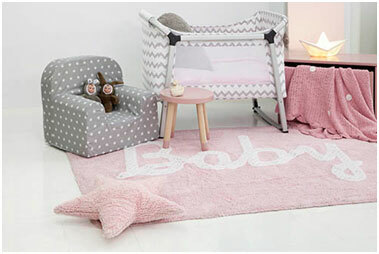 Maria's Space: Make Baby's Room As Safe and Beautiful As It Can Be! Make Baby's Room As Safe and Beautiful As It Can Be! Earth Day is just around the corner and it’s a great time for parents and expecting parents to think about how they can make their nursery safe and healthy for baby. 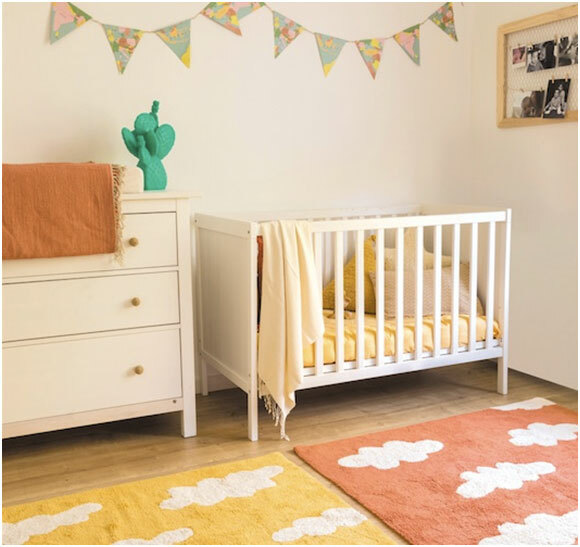 The folks at Lorena Canals, home of eco-friendly rugs for the home, have some suggestions for creating the perfect eco-friendly nursery for your baby. Go Green with Bedding & Flooring: There are a few items in the nursery that are best purchased in organic cotton and eco-friendly fabrics and materials. Think mattresses, beddings, rugs, and paint. If flooring is optional, choose bamboo or hardwood over carpeting which contains allergens and chemicals. Carpeting is harder to clean and keep out dust and dirt. Choosing organic, eco-friendly products are free of toxic compounds and chemicals, and much better for baby. The Perfect Palette: Babies respond better to soothing paint and nursery colors in a soft palette like greens, aqua blues and pale pinks. Paler colors are calming and help induce sleep. Bright, bold colors are patterns can be fun, but are stimulating, something to keep in mind when the purpose of a room is to sleep. When selecting paint, choose one free of VOC’s (Volatile Organic Compounds containing carbon chemicals). It’s Play Time: Designate a specific area to the room for reading, listening to music, snuggling and bonding in baby’s nursery. If you make an area for this, baby will soon learn that pleasant things happen here. This area could include a rocking chair, small child’s chair, a basket of toys, a bookshelf (anchored to the wall) or basket for books and a plush rug for the floor. Anywhere that you and baby can spend time awake together is perfect. 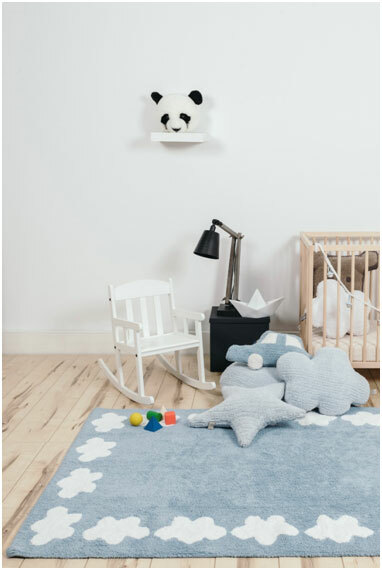 Opt for an organic, hypo-allergenic rug like Lorena Canals since baby will be spending much tummy and play time on the floor. The Ideal Feeding Area: There’s nothing like a nice glider or overstuffed chair with an ottoman for feeding baby. Daytime, and especially night time, feedings will be much more comfortable and relaxing in a great chair. Add a cozy pillow for your lower back and a nursing pillow to support your arm that holds baby. Whether you’re nursing or bottle feeding your little one, support and comfort for you is key. If you’re relaxed, baby will be too. Keep a basket nearby for items like burp cloths, baby wipes, books or magazines, extra pacifiers, and any other items you may require while feeding. Time for a Change: Before you know it, you’ll be a quick (diaper) change artist like most parents. This can be a changing table or a dresser with a changing mat. Before purchasing a changing table, consider your needs beyond diaper changes and think about you can use this piece of furniture when your baby is out of diapers. Keep essentials like diapers, wipes and diaper cream close by so that the important things are always within arm’s reach. Invest in a high-quality diaper pail to place right next to the changing table to keep baby’s room smelling fresh. The Importance of Air & Light: A few weeks before baby is expected to arrive, open the windows and air out the room, especially important if you’ve been painting and wallpapering. Lighting may not top your list of nursery needs, but it is no less important. It’s a great idea to have a night light or small lamp in the room to check on baby during the night and for middle of the night diaper changes and feedings. It’s also nice to have a lamp near the feeding and play area. Choose soft, less harsh lighting that’s soothing to baby. Make sure to place the crib away from the window as bright sunlight or street lamps may hamper baby’s ability to sleep. Lorena Canals is the founder of the Spanish lifestyle brand by the same name and is making her eco-mark in the North America with gorgeously designed, eco-friendly and exceptionally-made, washable rugs and cushions in adorable shapes, designs and colors. They are also all natural, hypo-allergenic and functional. Lorena is a mom of two and has been designing and creating products for children’s rooms for 25 years.